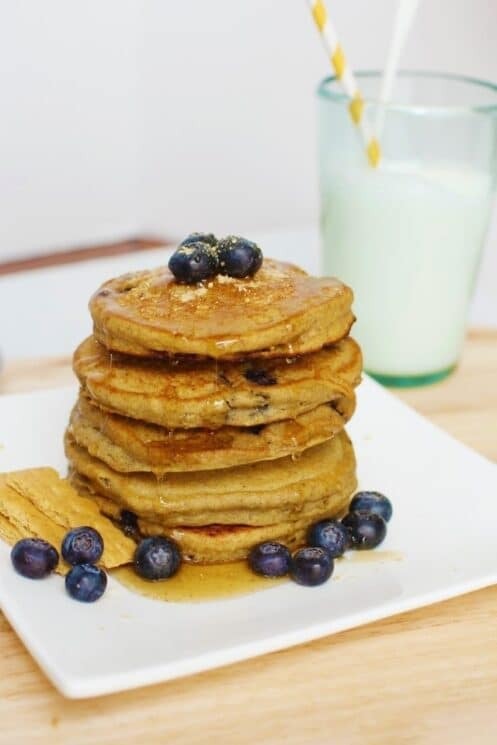 Blueberry pancakes are a classic ‘kid breakfast’ and a delicious way to add extra nutrition to your morning. 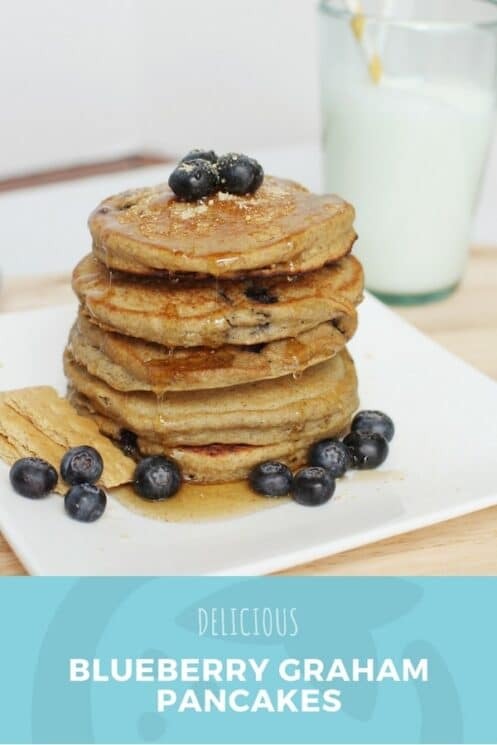 Try our twist on blueberry pancakes with this new recipe! Blueberries are such a delicious fruit. When they are heated just a bit, like in a pancake, they literally explode in your mouth and release a whole lot of flavor. If you are using fresh blueberries, then you will not run into the problems that you will with frozen blueberries. Fresh blueberries out of season can be really expensive and so frozen blueberries are a great option, especially in baking. The downside is that frozen berries bleed juice into the batter turning your delicious baked good a not-so-appetizing shade of purple/green. 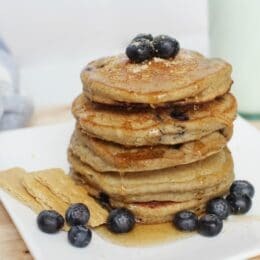 So when you are putting blueberries in blueberry pancakes, there are a couple of tips to make them taste delicious, and look delicious too! Pour the pancake batter into your prepared pan, then place the fruit on top of the pancake while the batter is still wet and unset. Dab a bit of extra batter on top of each of the berries you placed to seal them in and protect them slightly from the heat of the pan. When you add the fruit in this way, the berries don’t have a chance to dye your pancake batter. Thaw your blueberries and pat them well with paper towels. Then toss them with a little bit of your dry pancake mix before adding them to the pancakes. 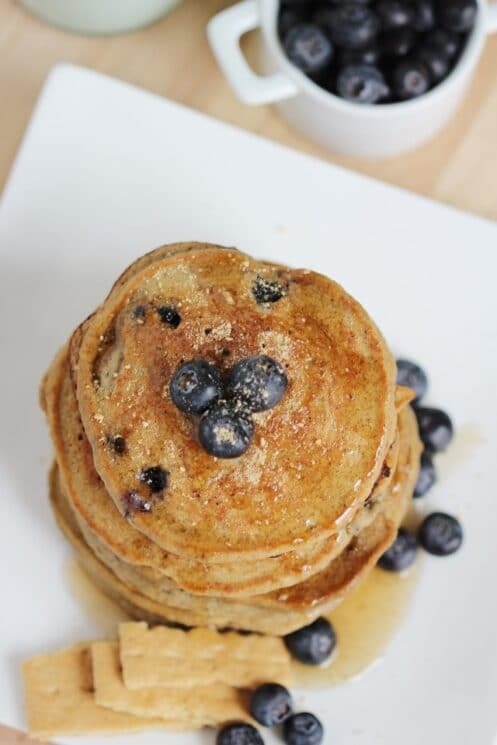 Gently fold them in and voila – beautiful blueberry pancakes! Are fresh blueberries better than frozen? This is kind of a loaded question because it depends on what you are talking about here. Part of it is opinion – do you like the flavor and texture of fresh blueberries better? I would say yes for sure! But lets talk about nutrition for a second. We get this question all of the time. And the answer might surprise you. There is a difference between unhealthy processed foods and healthy processed foods. Freezing is a very healthy way to process freshly picked fruit. With berries, they are typically hand-picked right off the plant and then frozen almost immediately. This preserves the fiber, minerals and vitamins in the berry because there isn’t a lot of time for it to sit and lose those nutrients. With fresh berries, after they are picked they are taken to a packing plant that is located on the farm or to an off-site packing company where they are sorted, packaged, labeled and shipped to grocery stores. If the fresh berries are not stored, handled or shipped properly, some of the fiber and other nutrients may be lost. In the end, frozen may actually have a higher nutrition content than fresh! I prefer fresh berries, but sometimes frozen berries have some real upsides. Fresh berries usually last about one week (if my kids don’t eat them all the first day). A pack of frozen berries will last for about a year. You have one year from the purchase date to eat those frozen berries. One package of fresh berries is more expensive than a bag of frozen berries, so you get more fruit for about the same price. 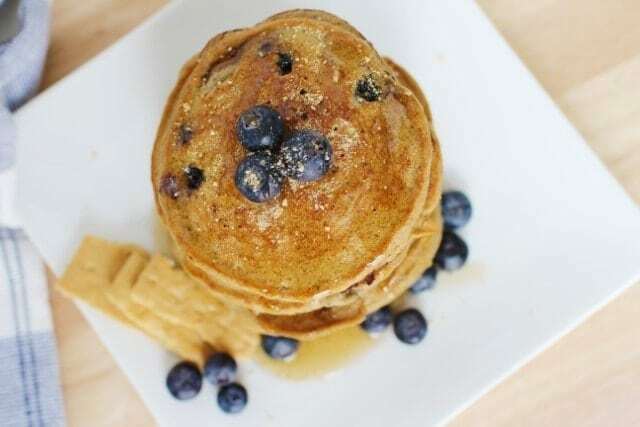 The difference between fresh blueberries and frozen blueberries in pancakes in my opinion isn’t a big one, so if you aren’t making your blueberry pancakes during blueberry season, use frozen for sure! Why the Graham Cracker Crumbs? In a medium-size bowl, combine graham cracker crumbs, flour, and baking powder; set aside. Add egg, milk, and honey to a large mixing bowl and whisk until well blended. Add flour mixture to wet ingredients, and stir just until moistened; gently fold in blueberries. Heat a non-stick skillet or griddle over medium. Pour batter onto hot skillet, using 1/4 cup for each pancake. Cook until bubbles form, then flip and continue to cook until browned on both sides and cooked through in the middle. Repeat until all batter has been used. 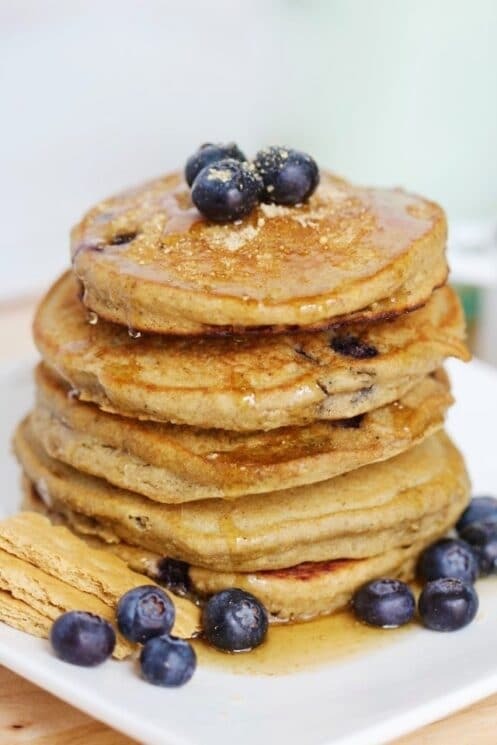 Top pancakes with butter and maple syrup, with extra blueberries on the side. Didn’t taste super graham crackery but overall very good.